St. Martin's Griffin, 9781250013866, 320pp. 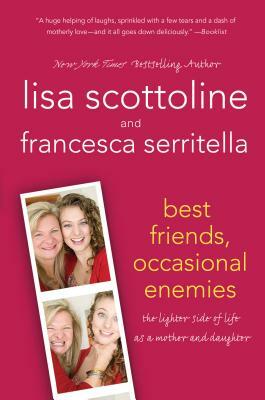 In Best Friends, Occasional Enemies, New York Times bestselling author Lisa Scottoline and her daughter, Francesca Serritella, are the best of friends—99.9% of the time. They're number one on each other's speed dial and they tell each other everything—well, almost everything. They share shoes and clothes—except one very special green jacket, which almost caused a catfight. In other words, they're just like every mother and daughter in the world. Best friends and occasional enemies. Now they're dishing about it all: their lives, their relationship, and their carb count. Lisa on Being a Mom: Motherhood has no expiration date. Francesca lives in the city, and I worry about her all the time. My daughter moved out, so why am I still lactating? Francesca on Being a Daughter: My mother is always right. Just ask her.